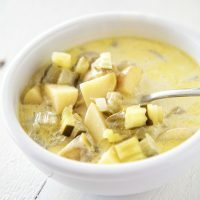 Dill Pickle Cheddar Cheese Soup: Dill pickle lovers will go crazy over this pickle, potato, and cheddar cheese filled soup. I know it sounds odd but it’s so good. We are a pickle loving family. I prefer a sweet pickle but certainly don’t turn down a dill pickle. My husband on the other hand LOVE dill pickles. Every sandwich he eats has to have dill pickle on it. If we get pickles on our plate with a meal we ordered I just always hand it over to him because I know he really wants it. 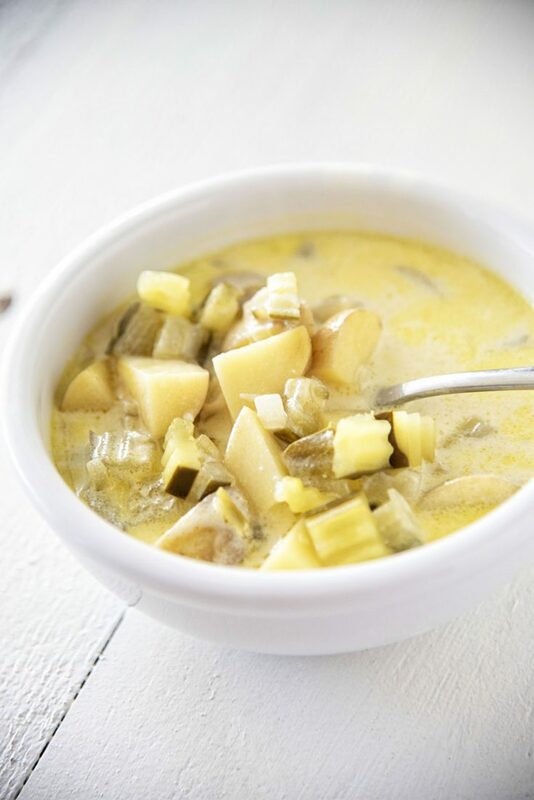 So when I saw years ago on Noble Pig’s site a recipe for Dill Pickle Soup I considered making it for my husband. The recipe got bookmarked and then I kind of forgot about it and never made. Like so many recipes I find. 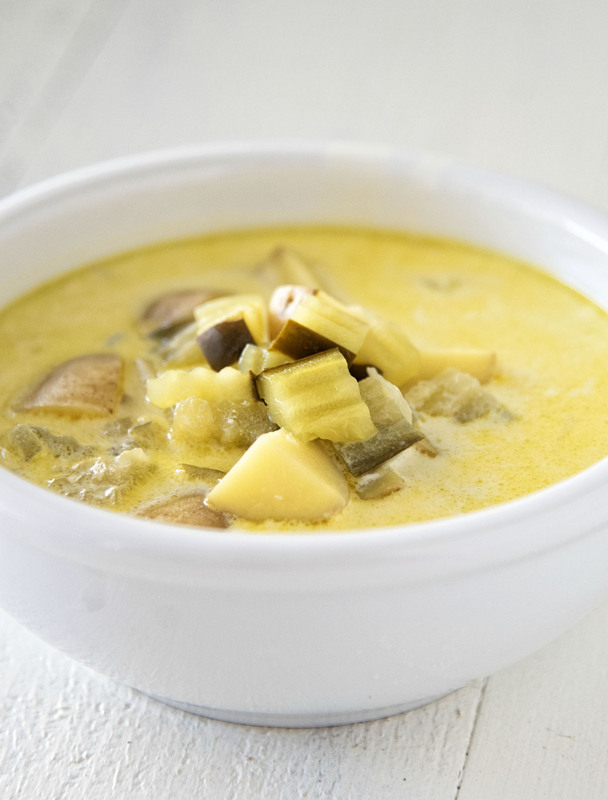 But while eating cheese and pickles as a meal the other day, something we do often I was reminded of the soup. I went back and looked but her soup didn’t have cheese in it and I wanted cheese. Went searching around for a recipe and found one I could adapt to my tastes and needs. I use a powdered white cheddar cheese in this recipe…along with a lot of other recipes on this blog. It only comes in 1 pound size but it’s worth it to have. You can not only use it in soups but you can make your own version of Kraft Mac and Cheese that is even better. I figured this soup would be good for pickle lovers and I was right, it’s down right addicting and we at the whole pot within two days. Sauté onion until translucent, about 3 minutes. Add broth, pickles, pickle relish, pickle juice, and potatoes. Bring to a boil, reduce heat, and simmer until potatoes are tender, about 20 minutes. Blend flour with sour cream and powdered white cheddar cheese. Temper the sour cream mixture by whisking in a little hot soup. Pour tempered sour cream cheese mixture back into the hot soup, whisking constantly, until it comes to a boil. Reduce heat to low and simmer 3 minutes or until slightly thickened. Add in the 1 cup cheddar cheese and mix until melted. At this point, the soup can be left chunky or puréed. I chose to stay chunky. 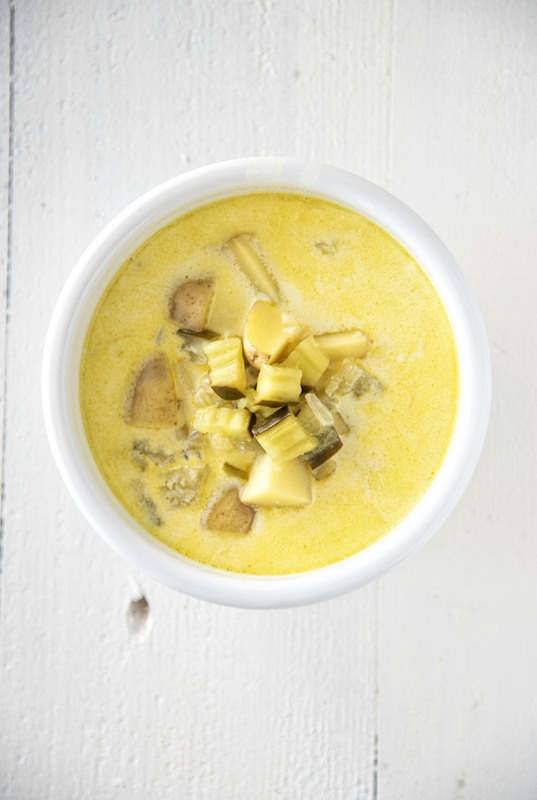 Reminds me of Polish Dill Pickle Soup … but more decadent. Cold Cucumber Soup is also delish.